I saw this BBC article the other day and the topic immediately interested me. 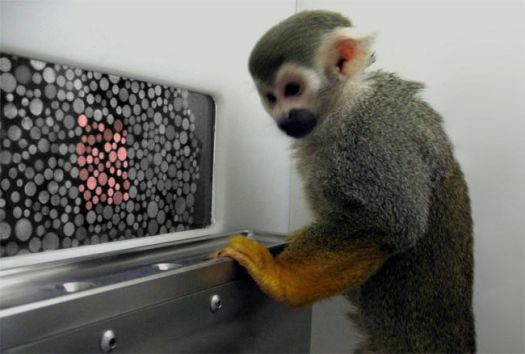 It seems gene therapy may hold the answer to eliminating color blindness in humans, based on this successful test on monkeys. I've never put much thought in to the concept of curing color blindness. At least personally I don't find enough of a hindrance on a day-to-day basis for it to be crucial for me. Some people may feel otherwise, particularly when their vision could prevent them from being able to become a pilot, or makes it impossible to identify the colors of traffic lights, wire electronics or perform any of a variety of other color-dependent tasks. I probably wouldn't be allowed to get a pilot's license and I certainly have trouble with all those color-coded wires in electronics, but over time I've gotten used to a number of the challenges I face. The therapy was performed on young male monkeys, Sam and Dalton, and the results from the two year treatment have remained stable. While correcting color vision deficiencies caused by issues with cone response is one possible use for this technique, this Wired article also points out that it could be used to threat age-related macular degeneration which also impacts color perception. What impact could this have on me, or other colorblind people' It seems likely that such a treatment could only be applied when someone is still young, so it might be too late for me and plenty of others. Artistically it is interesting to think about because many times I have seen it mentioned that people find the colorblind have a very different approach to the use of color and often it impacts how they use photography or other art forms which can make their work unique compared to color normal artists. Whether I agree with that or not is hard to say, I certainly have not personally seen sufficient evidence to support it but I'd like to believe it's true! Another question that rises to mind is whether everyone who is colorblind would even be interested in this kind of treatment. Many deaf people have formed a community and culture around their shared hearing differences and resist treatments or implants which might improve or restore their hearing. I have never seen that kind of community for colorblind people though. In many ways we're left to our own devices to compensate for our difficulties and interact with the world around us. Sometimes it seems like those with color vision deficiencies are overlooked. You can use a computer without hearing, most operating systems will even read what's on the screen aloud for those who are deaf but accessibility for the colorblind remains poor. Color combinations chosen for software are often exactly the wrong thing for those who are colorblind and there are poor or often nonexistent accessibility features and tools in place to get around this or let you change the colors. When you can change them, it isn't always easy to do. Chat clients, like Digsby, are notorious for using red & green to indicate the away status of your contacts. Unfortunately I can rarely tell whether someone I want to talk to is away with a quick glance because those colored chicklets are useless to me, I have to hover over their names to see whether they're away or not. This might seem like nothing but over time repeated offenses like this by the applications most people use and take for granted every day can grow to be somewhat frustrating. Plenty of other programs get this wrong (Microsoft Word uses red and green to indicate spelling and grammar errors) as well and it's a problem outside of the computer environment too, as I mentioned in the Seekey article. Perhaps this kind of treatment will solve the accessibility issues that colorblind people find on a daily basis. It seems to be rather drastic and distant (it doesn't seem likely that this will be available to the general public for a while still) compared to the relatively simple and immediate effect that changing the default colors used in software or devices could have. At the very least it should be reasonable to have alternate color schemes easily available for software to improve usability. OS-level utilities could eliminate the need for programs like WhatColor and eyePilot as well.